Since our announcement on June 9th, we’ve spent the last couple of weeks here on Jazz.net sharing with all of you more information about the new features and their value. We’re planning on spending some more time in the next couple of weeks continuing that sharing. But today is an exciting day for all of us on the Collaborative Lifecycle Management (CLM) team—Version 6.0 is generally available! Visit us [at booth #203] at Agile 2015 to experience IBM’s DevOps solutions for collaborative development, continuous testing and continuous release & deployment. This is a culmination of a lengthy development cycle for us. If you were following along here on Jazz.net, we developed new capabilities over the course of 11 sprints. Much of that, which you’ll see as you look through the content in v6.0, was required for the effort—from the Jazz Foundation on up—to provide configuration management across the integrated solution. But what you don’t see, or what maybe isn’t immediately apparent, is all the work occurring behind the scenes. 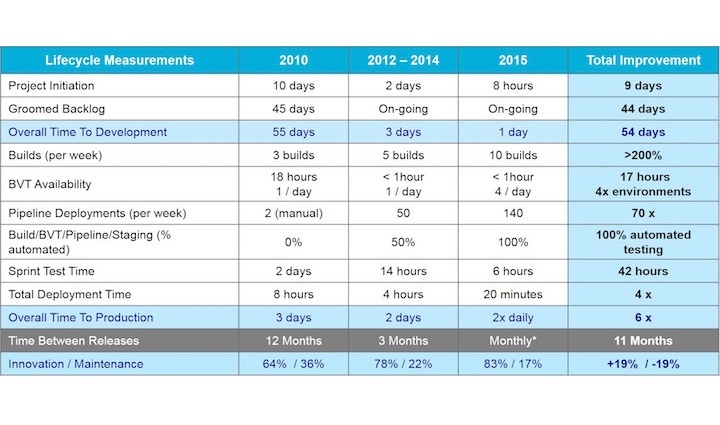 During v6.0, we shifted to building twice per day—10 times per week. This allowed us to slow the amount of feature change occurring in just daily builds to ensure a more stable experience. We expanded our development pipeline to 14 different tests, and those tests run against every build. If you look back as far as five years ago, we had no automated development pipeline. So from zero automated pipeline testing to running 140 pipeline tests (14 tests for 10 builds every week) in five years. We built a federated environment in which to test configuration management. This distributed environment was built to mimic some of our more complex customer shops and allow us a much greater depth of testing for v6.0 than we’ve had in the past. Feature development included Configuration Management as well as a number of DevOps enhancements. We’ve put Configuration Management behind an activation key. The intent here was to ensure you are walking through all the considerations related to CM before you turn it on. If you’re worried that CM is really just for clients who are building complex hardware devices, it’s not. You can use CM in simple scenarios as well. And finally, of course, once you’ve considered it and understand how you might use it, visit Getting Started with Configuration Management. But CM wasn’t the only set of feature work in CLM v6.0. SAFe 3.0 brings a new template to Rational Team Concert (RTC) and extends a project to the business teams involved in development. You can get out of the box and up and running with the SAFe template, improving agility and predictability with role-based dashboards. Continued scalability improvements to Enterprise Edition, integration with UrbanCode Deploy, Single Sign-On (SSO) for Kerberos and OIDC for all RTC clients are numbered among other enhancements. Finally, our Reporting team improved setup and configuration, simplified the customer experience, integrated reports into QuickPlanner, and have given you “near live” operational reporting. I urge you to stop by our Deployment wiki, one of our most popular destinations. All in all, it’s been a very active release for both Development and Operations, and one we’re very proud of. Good stuff. Unfortunately the total improvement on deploying updates will likely remain at 1 x.